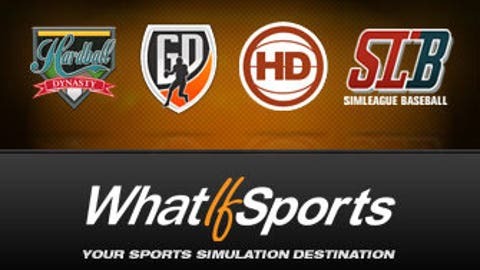 WhatIfSports.com simulated the World Series 501 times to predict a champion. Oct. 29, 2014. That was the day that the Kansas City Royals nearly won their second World Series in franchise history. Down by one, with two outs, in the bottom of the ninth, Alex Gordon was credited with a single, but made it all the way to third base. Then, with the tying run 90 feet away, Salvador Perez popped out to the third baseman in foul territory. Ball game. The Royals have sat with that feeling for months. As for the other side of the coin, the Mets haven’t been to the playoffs since 2006. Be prepared to see some high-quality pitchers’ duels in the 2015 World Series. Both the Royals and Mets concluded the regular season in the top 10 in team ERA. I guess all that talk of being on an innings limit is out the window for Matt Harvey, and as well it should be. A shot at pitching in the World Series should trump any concerns about future arm fatigue/recovery. Harvey will take the mound for Game 1 in Kansas City. This will be his first playoff start on the road and it will be in a hostile Kauffman Stadium. In the regular season, Harvey was 5-5 with a 3.42 ERA on the road. For Game 2, Jacob deGrom gets the nod. Like Harvey, deGrom was a better pitcher at home this season. However, unlike Harvey, all three starts for deGrom in this postseason have been on the road. In those three games, he went 3-0 with a 1.80 ERA. "Thor" will pitch in the first World Series home game for the Mets since 2000. Noah Syndergaard has been phenomenal at home in 2015. In the regular season, he was 7-2 with a 2.46 ERA. In his only home playoff start, Syndergaard allowed one earned run and the Cubs could tally only three hits off of the rookie. Speaking of rookies, Steven Matz will start Game 4 of the World Series for New York. He is already used to the big stage. Matz pitched in the series-clinching game in the NLCS. Also, in 13.2 innings of work at Citi Field in the regular season, Matz was 2-0 with a 1.98 ERA. The Royals’ Game 1 starter will be Edinson Volquez. He has only allowed eight earned runs in three total starts this postseason. Unfortunately for Volquez, Kansas City only won one of those outings. In his only home start of the 2015 playoffs, Volquez pitched six innings of shutout baseball against the powerful Toronto bats. In the regular season, he was 8-4 with a 3.48 ERA at home. Johnny Cueto will take the mound in Game 2. It has been a rocky postseason for Cueto. In three games, he has allowed 14 total runs. Two of his contests were at home. The Royals won both of those games. His lone road start was in Toronto. The Blue Jays tagged him for eight earned runs. However, in the regular season, Cueto was 3-4 with a 4.40 ERA at Kauffman Stadium. While the ERA hasn’t been great for Game 3 starter Yordano Ventura, his Royals have won three of the four games in which he has pitched. The first game was rough. Ned Yost gave Ventura a short leash and the pitcher was pulled after two innings against the Astros. After that, Ventura has gone through five innings of work and only allowed three earned runs in each performance. In the 2014 playoffs, Ventura allowed more than two earned runs once. This time around, his last start was his only game where he allowed fewer than three earned runs. Rounding out the Royals’ rotation will be Chris Young. The 36-year-old veteran is making quite the impact for Kansas City. Though he has only pitched in two games (8.2 innings), Young has allowed only three total runs in the postseason. On the downside, the Royals bullpen knows that they are in for a long day’s work when Young gets the start. He hasn’t pitched more than five innings in a game since October 2nd. Enough about the arms. How about those offenses? The Mets and Royals combined for 29 home runs (15 for KC). The AL’s representative produced 99 hits this postseason. That is 31 more than the Mets’ total. Alcides Escobar won the ALCS MVP by batting 9-for-23 (.391) with three extra-base hits. Kendrys Morales and Salvador Perez have both hit four home runs in the 2015 playoffs. As for the NLCS MVP, that decision was rather easy. 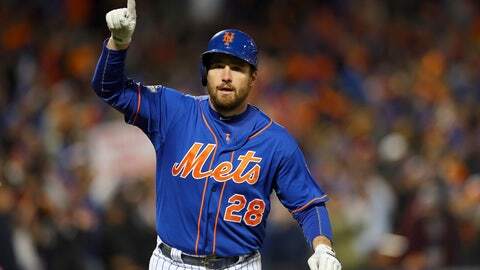 Daniel Murphy launched a home run in each game against the Cubs and currently has a six-game HR streak. Juan Lagares has also been a pleasant surprise for the Mets. He is second on the team with a .385 AVG in the postseason. New York was victorious in 66.3 percent of simulations, with a six-game series in the Mets favor the most frequent outcome. In simulations in which Kansas City won, the Royals’ best shot was a seven-game series. The Mets’ rotation paved the way in the simulations. Harvey (3.52 ERA, 0.86 wins), deGrom (3.62 ERA, 0.75 wins), Syndergaard (3.68 ERA, 0.55 wins) and Matz (3.43 ERA, 0.50 wins) all posted better ERAs than any Royals starter. Murphy’s torrid home-run pace slowed, with just 0.65 homers per series, but he still batted .287 with a team-best 6.71 hits per series. Kansas City’s best bat belonged to Lorenzo Cain, who hit .292 with 6.93 hits per series.